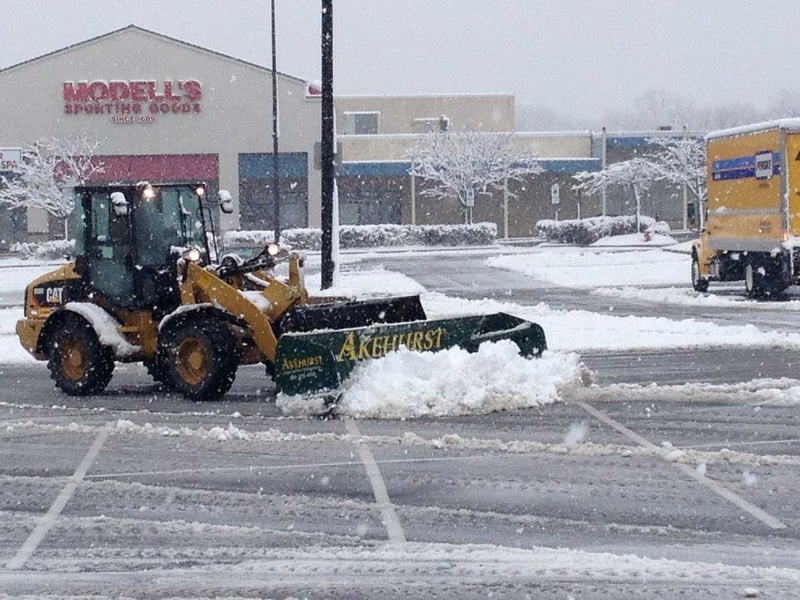 Akehurst Truck equipped with plow and salt spreader clears shopping center of snow during snow storm. Many of our clients and the public are unaware that at Akehurst, we think about, talk about and work on snow removal 12 months of the year. Reasons, there are a lot of logistics and careful planning that must take place in the off season in order to properly execute our service during the typical four active months here in Maryland. And with that thought, we felt it to be appropriate to give you a behind the scenes look at how we handle snow and ice management on the inside of Akehurst when it comes to our snow services. The portfolio of accounts we service grows each year (over 400 properties serviced last winter). Due to availability of man power and equipment, the amount of new sites that we take on annually as we grow our footprint fills up extremely fast … and many potential new jobs are placed on a waiting list. There has also been a trend of potential new customers who wait until December 1st to contact us for our services, sadly we decline them due to our routes being filled. 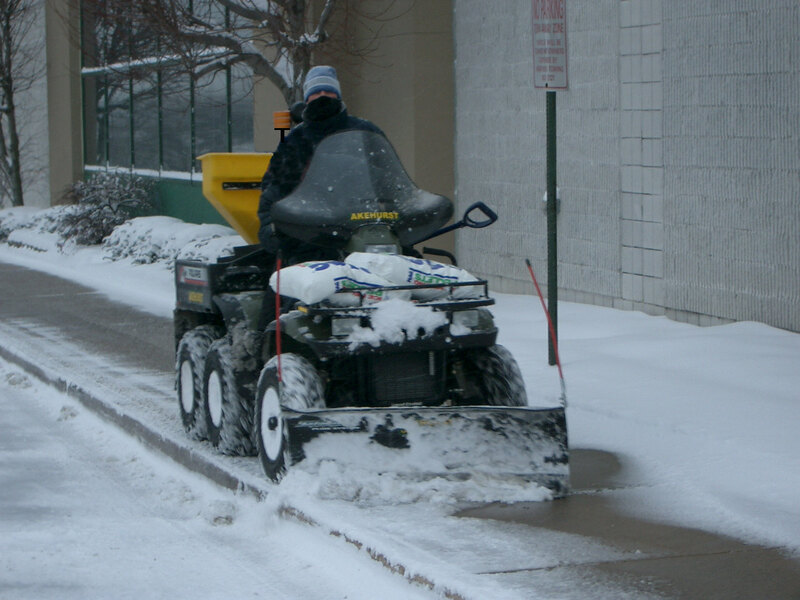 As a result of our workload filling up quickly, we recommend that our existing clients renew their snow management agreements with us between early spring to early summer to insure that they are on our list to provide services for the next season. With the motto of, “What are we trying to do? How are we trying to do it? What can we do better today than yesterday?” at the forefront of our minds, the previous season is analyzed for our strengths and weaknesses throughout the firm. The strengths are exploited to expand upon in the future while the weaknesses are analyzed and either eliminated or replaced with newly implemented processes, thoughts etc..
During the “Off Season”, routing of our properties begins to take shape by creating a list from our secured accounts list and assigning them to an Account Manager. Our Account Managers are designated with a portfolio of snow accounts to manage based on their geographic locations and the size and extent of the amount of work. Each crew of snow fighters under the direction of the Account Manager is assigned to a snow route. These individual routes are kept small so that in the event of an exceedingly heavy snow fall, the crews are able to service them as quickly and as safely as possible. Each Account Manager, with their team of snow fighters and equipment will assemble plans based on the worst case scenario for a heavy impact of snow on each account that he or she manages. Equipment used the previous season is gone over and repairs from the wear and tear are performed by our fleet support staff. Spreaders and plows are prepped for not only going into production again, but also for their idle time of sitting in storage for the summer months. New equipment is also purchased to replace undesirable pieces and added to support the demands of our newly acquired properties that we will manage the upcoming season. Around mid November, as the cold arctic air begins to filter down into the United States, our focus on snow removal intensifies. At Akehurst, our hours of operation routinely fluctuate with the weather forecast during the winter months. We monitor the weather conditions throughout the season utilizing a third party meteorological firm who is also on duty twenty-four hours seven days a week. Phone conversations, text messages as well as real time data streamed to our office and cell phones allows our fingers to constantly be on the pulse of Mother Nature. We do not take “Winter Storm Advisory” issued by the National Weather Service lightly. While they are not as definitive as an issued “Storm Warning”, we know that the weather can be unpredictable. As a result, whenever there is a hint of anything, we spring into storm mode. Sometimes, we spring into snow mode and the storms do not materialize, but we know that we must always be ready because our clients are counting on us. Following long range forecasts, our salt supply is routinely checked at each of our locations and storage sites across our wide service area to insure that adequate inventories are on hand for a minimum of three back to back to back storms. This inventory helps us to continue to service even when the trucking of materials due to poor road conditions prevents them from doing so. It also will allow some breathing room for salt shortages should they hit the mid-Atlantic region. Equipment is checked and re-checked again and again making sure that everything is in working order. Twenty-Four hours before an eminent threat, one will find a meeting taking place in the Akehurst War Room at our corporate campus between the Operations Manager and all Account Managers. This meeting is where the final outline of attack for the specific forecasted storm is finalized. The group discusses the weather forecast. Paying close attention to details such as precipitation start and end times, the type of precipitation that will fall, its intensity, accumulation amounts as well as air and ground temperatures current and estimated before, during and after each event. These details are deeply discussed to better predict what our crews in the field will be dealing with. Between this group that meets, there is well over 125 years of experience at the table. They combine their experiences with the weather data and each job site specific requirements such as; client hours of operation, site specific obstacles, geographic locations within our service area and much more to create a storm specific plan of attack for the impending storm. Should the predicted storm be a plowable event, Sites requiring specific equipment such as large loaders will be “mobilized” (transported). Pre-treatments of liquid salt brine and other de-icers will be scheduled and applied to prevent the frozen precipitation from binding to the pavement surfaces. We know that next to the equipment being able to perform during an event that communication with our staff and clients before, during and after events is an essential component to proper job performance. All of our staff will be contacted with a start time or tentative start time so that they can be prepared by getting their rest and for taking care of their families at home in advance of their deployment during a winter weather event. Part of the Akehurst training program that our employees undergo throughout the year is pinpointed on both snow removal tasks and how to perform them. In addition, the training also offers them thoughts on what they should do and will need for themselves and their family before a snow storm hits so that they are prepared both physically and mentally and that their families will have the supplies at home and are taken care of while they are deployed to fight mother nature. Contact with each of our clients is conducted to discuss the upcoming storm. Our discussion will zero in on the weather predictions as well as the Akehurst game plan on when and how the property will be serviced so that everyone is on the same page. As the snow/sleet or freezing rain begins to fall, crews if not already on the job sites are dispatched out to service their routes. The crews will begin working on the sites based on the contract requirements. In the event of heavy and fast accumulating snow, the concentration on clearing the property and building access points will be accentuated during that time over the other “less traveled” areas. For larger accumulating snow storms, pushing snow can create large piles. Some clients can not have large piles on their properties for various reasons ranging from the need for ample parking, sites that were not designed for places to pile snow, parking garages with weight factors, etc.. Our Account Managers will be in communication with the property owner or manager to discuss logistics for hauling snow away or out of these locations. Ground temperatures and weather conditions are routinely monitored during and after each event. The temperatures are a vital tool that we utilize to manage our properties, and as we all know … living in Maryland, the weather can change from better to worse or worse to better in an instant. Following the air and ground temperatures and the precipitation forecasts at real time throughout an event helps us to manage our properties more efficiently. Crew staffing, de-icer inventories, equipment break downs and job progress are closely followed throughout each event so that each property’s needs are met. Depending on the intensity and duration of the storm, individual storm clearing and management may take from just a few hours all the way up to two weeks for the mega storms. 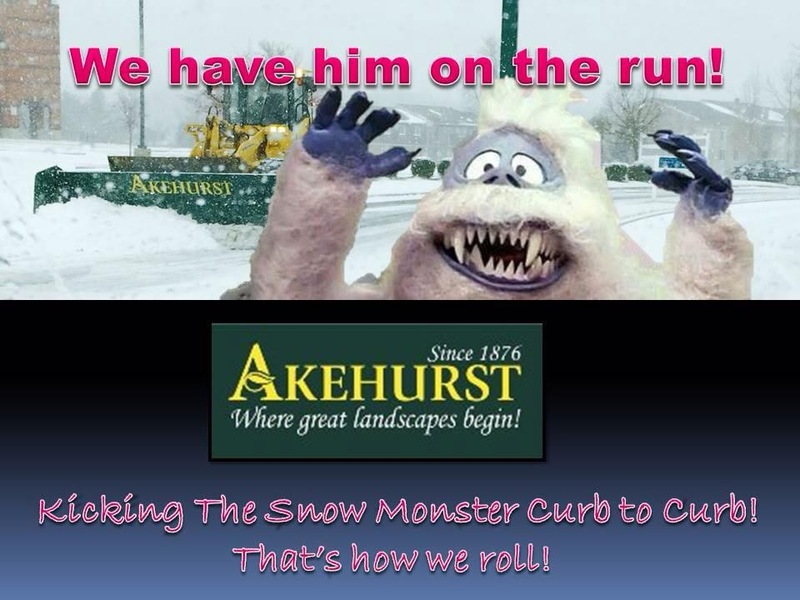 After the storm is over and the clearing of snow from the walkways and pavement areas has ended, Akehurst is still hard at work. Salt supplies are replenished and equipment repairs are performed to prepare for the next event. For many of our properties we perform ice checks. Ice checks consist of the dispatching of crews (typically performed in the mornings and evenings) the day or day(s) after a storm has ended. The dispatching of ice checks and the amount of times performed is dictated by temperatures, freezing and thawing cycles, site drainage as well as the type of site and the hours of operation or amount of vehicular and or pedestrian traffic that it has. During an ice check, the crews will visit each site on their routes to inspect and treat any areas of ice caused by the melting of snow and re-freezing on the sidewalks and pavement areas. Having ice checks performed when this happens greatly reduces the liability for the property owners. As with all winter weather events and ice checks, Akehurst keeps documentations of weather data and times of service as well as what was performed to each site should a client need copies of the documentation. Every snow management firm, no matter how big or small has limitations by their availability of labor and equipment. At Akehurst, we take this very seriously. Our resources must be very carefully routed to insure that our clients have the proper care to reduce risks caused by the winter weather. 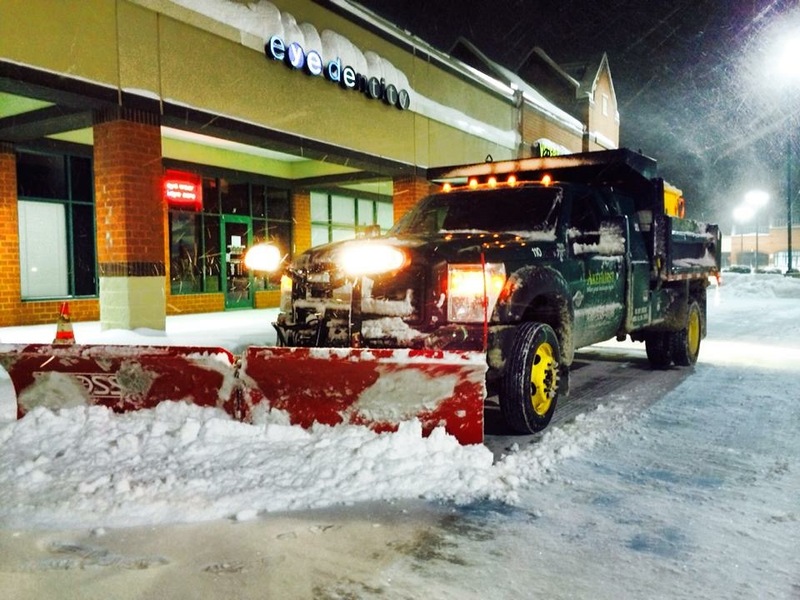 Due to the amount of properties that we service we utilize a number of SubZero Partners throughout the winter season to assist us in performing our snow removal services. These SubZero Partners are subcontractors that have undergone our screening process and have been approved to be a SubZero Partner. Akehurst’s SubZero Partners are made up of individual companies who may specialize in other areas of service such as; paving, concrete, excavating, construction, arborists, swimming pools and more. Not only do they bring their assets to assist us during a snow storm, but they also are capable companies that broaden the depth of what we provide for our clients year round. Should a client have a need for concrete repairs, we can fill their need with a firm that specializes in that field. Categories: Snow and Ice Removal.